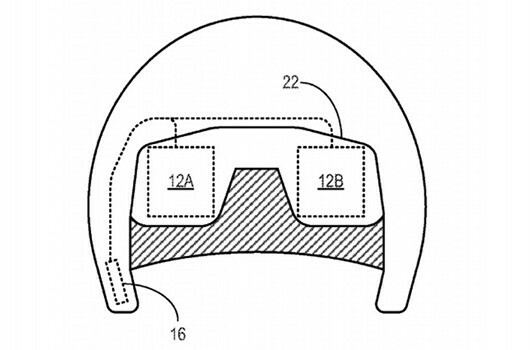 Microsoft has patented a display helmet, eerily reminiscent of the Nintendo On fake. Analysed thoroughly by Patent Bolt, the helmet may be used both to augment reality in the style of a heads-up display (HUD), as well as project stereoscopic 3D images. I do not think that this device will ever see the light of day, since it is now common belief that most consumers do not want wearable accessories, particularly not head gear. What I do still believe, though, is that we may see proprietary displays for home consoles. Sony's 3D display is an example already available on the market. And years ago, there was proof that a Japanese gaming company had invested in 3D projection technology. A venture that has yet to be go public. And Nintendo experimented with a proprietary 3D screen for the GameCube which was practically ready to hit markets. With new competition in the form of streaming platforms, tablets and smartphones (although horribly overstated) forcing gaming consoles to offer unique features, such proprietary screens may be just what the doctor ordered. At the time, these trouser-like garments had been a widespread type of clothing of Persians, Asians, Bactrians, Armenians and in many cases the Tigraxauda Scythians and were believed to become unisex in the time.